In the online casino world, things can change very quickly sometimes. Companies are often merging or buying each other out, especially when it comes to software and game providers, and this is complicated by the fact that some software developers also act as operators and run casino brands. This is particularly relevant right now when a lot of lesser-known game developers are trying to build up in a way to compete with the bigger competition. Some of these companies, like SkillOnNet, have been gaining a lot of ground. A recent move has them taking some major steps towards being in the upper tier themselves. SkillOnNet has purchased Jackpot Party Casino, and they have turned it into the new Slots Magic Casino. 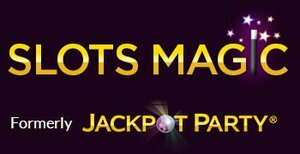 If you were a player at Jackpot Party Casino already, then there's nothing special that you need to do because your account has been automatically transferred over to Slots Magic. However, there are a number of improvements that you should be aware of. First of all, you'll now have access to tons of new games on top of the games that you were already used to. They will still be using all of the games provided by WMS Gaming, but you'll also be able to play games provided by SkillOnNet. To give you a chance to try out the new Slots Magic Casino, they are giving every player who has already established a Jackpot Party account in the past a £10 free chip. If you don't have an account, then you can sign up at Slots Magic to receive your free £10. This free chip opportunity will give you a chance to try out the new software with the expanded game selection to see how you like it. New players can also get up to £2,500 in bonuses across their first four deposits as a part of the Slots Magic welcome package. There are a number of major benefits that come other than the expanded game selection and the increased bonus opportunities. For example, Slots Magic will be available in more than 20 languages to give players more access than ever no matter what language they speak. A number of new banking methods are also available, including PayPal, and there are a ton of features to choose from including a special VIP program and live casino tables.